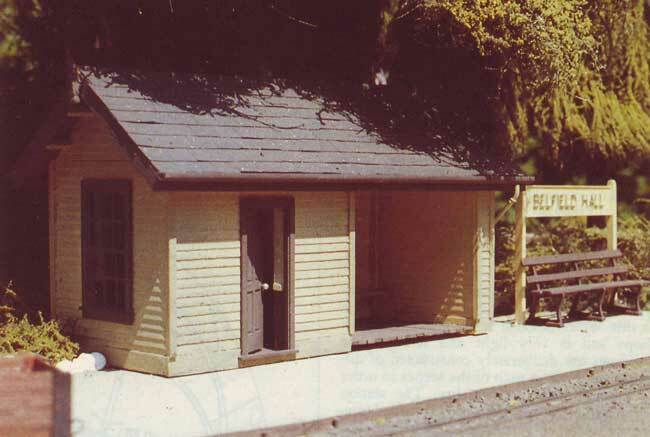 The Belfield Hall Estate Railway was a model of an imaginary, 15 inch gauge estate railway, in 7mm scale. In building the model, a baseboard had to be constructed and what developed became a concept that interested many modellers faced with restricted working or storage area, or those who like to have a short-term project every now and then. The BHER featured in the 'Railway Modeller', the main publication for the hobby and the 7mm Narrow gauge Association magazine. Both articles inspired further circular railways, one from East Anglia in 009 (which aslo featured in the 'Railway Modeller') and one in Canada. 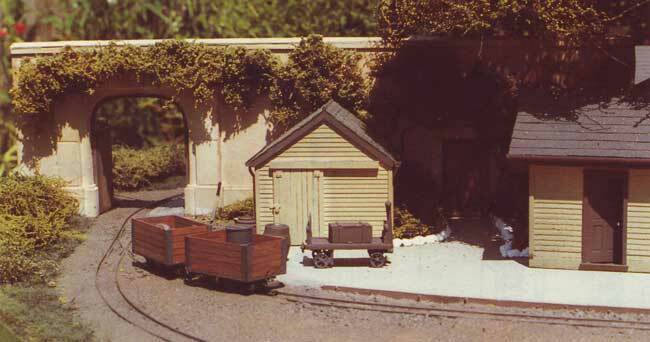 Latterly, the layout has been featured on Carl Arendts "Micro / Small Layouts for Model Railroads" web site. The BHER was eventually sold to Norman, an ex-coleague, who in turn passed it on to Tony, who remodelled the layout with his own scenic materials. The following description is derived from those magazine articles. 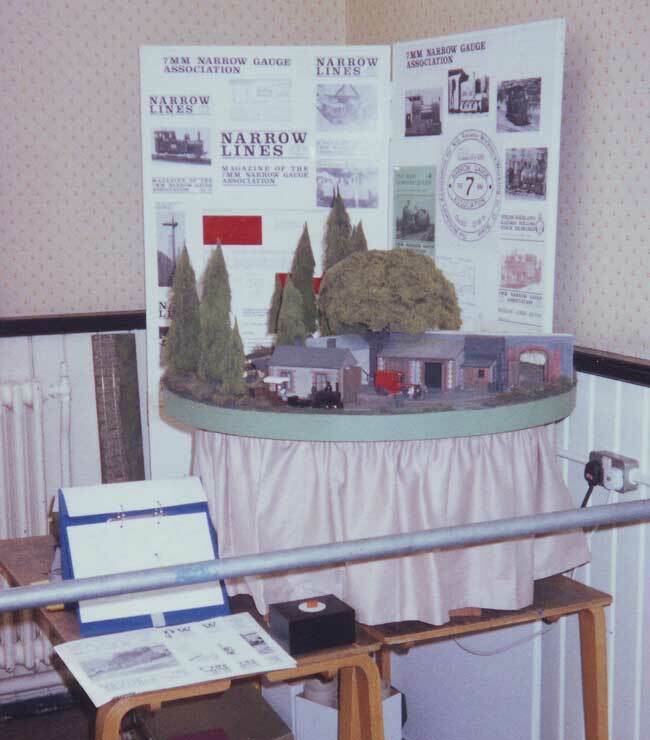 It was announced to 7mm Narrow Gauge Association members that at the 1990 AGM a new competition category was to be introduced for dioramas. I have always had an urge to build a diorama as being able to devote time to a small area can be very rewarding as the model develops much quicker than a complete layout. However, I had always been of the impression that it could not serve much purpose when complete and had not, therefore, attempted anything between a full layout and a stock display board. I have also had, for some time, a growing interest in 15 inch gauge railways and so it was not long before the two became entangled. The rules of the competition were that the model should be no more than three feet in any direction (a second rule regarding maximum board area escaped my notice and the model, as a whole, was excluded, but that's another story!). After a relatively short period, a scheme emerged comprising a three foot diameter triple diorama depicting different parts of a line, each separated by notional screens. I say notional, for to put a solid barrier between them did not seem necessary and might do more harm than good. 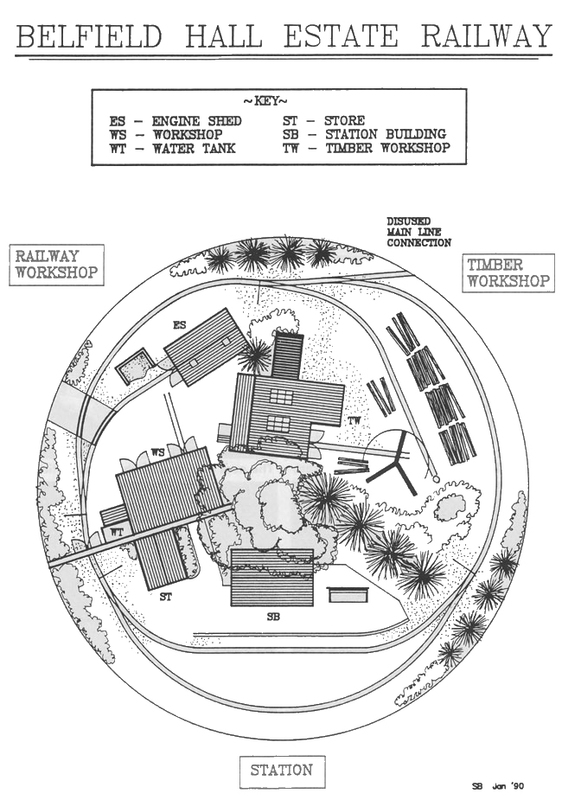 The only difference between the original sketch and the final model was that a road bridge scene divider became a garden wall, firstly for space reasons and secondly to fall more firmly into the Estate Railway theme. Track is all PECO 009 with one `Y' and the rest left/right hand points. This is pinned down through a cork trackbed to the chipboard below and ballasted with N gauge ballast and fine sand to disguise the under-scale sleepers. When sprayed dirty track colour, the effect is very convincing. I had intended to make my own curved pointwork in order to keep the track close to the edge of the board, but due to time restrictions proprietary points were used. The introduction of straight points meant that the line had to bend inward to keep the adjoining curves to a sensible radius which then allowed space for scenery on the edge of the board. These areas were then aligned with the scenic break trees to provide a much better separation than originally planned. Another advantage of the ,setting-ins' is that the track is continually winding, which greatly adds to the narrow gauge feel of the layout and makes the movement of the train more interesting. The working point levers are brass tube flattened from the handle down and pivoted in brass angles, soldered to a base. A length of wire from below the pivot connects to the tie bar. They work well and look quite good too. The levers from one scene are sometimes visible from another scene, but they do not detract from the overall effect. All buildings on the layout are made, primarily, of 'polyboard', a sandwich of polystyrene in thin layers of card. It's available from art shops and is very light and strong. The buildings are deliberately constructed of different materials in each of the scenes in order to enhance their individuality. The station buildings are horizontally weatherboarded (preformed timber sheet) painted gloss cream. The waiting room door and window are Grandt Line products. The roofs are `slate' i.e. postcard squares, laid separately; the only way! The main wall was made by laminating 'polyboard', then adding thin cardboard details. The wall was painted with several coats of a Dulux 'matchpot' vinyl matt to give a bit more body than usual paint. The other side is covered in Slater's sheet cobbles to give a flint wall effect. The engine works buildings are supposed to be rendered with brickwork quoins. The render was some left-over Polyskim, a brush-applied plaster finish, which gave a nice texture. The brickwork is pre-formed plasticard and the roofs are a combination of slate and corrugated iron, suitably distressed at the painting stage. The old barn in the background (the back of the woodshed) is roughly coated render with thicker card to form stone tiles. The gutters for both areas are made from the ribs of broken umbrellas, which I had read about some time ago and had always wanted to try. Although mine were made from a dubious metal, I was able to solder them to the brass rod downpipes with little problem. The rainwater pipe joints are short lengths of fuse wire wrapped around the pipes noose fashion, held in place with a dab of glue and the tails snipped off. The timber workshop is clad in vertical strips of timber with a corrugated (plasticard) roof. The logs are cut from prunings of Mallow or shrub Lavetera, the bark of which is one of the most suitable for scale models I have found. It is a large, fast growing shrub and provides a mass of lumber each year. At the centre of the layout there is the electrical connection device, which needs to be disguised in some way. My solution, in this instance, was to construct a cardboard box, shaped as closely as possible to the electrical gear and painted dark brown. 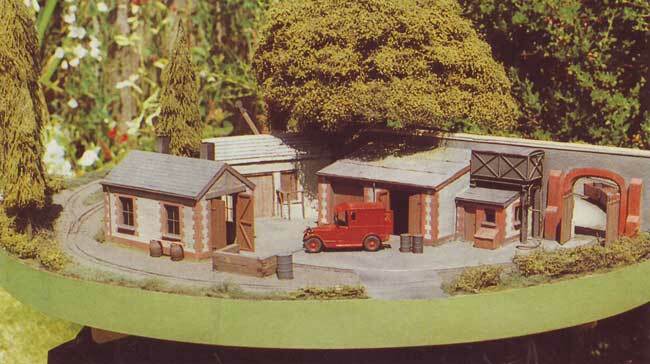 On the station and woodyard scenes, this is further disguised by shrubs, but on the engine works scene, it is completely hidden by the garage building. The grass/undergrowth is made from teased out carpet underlay, stuck down with white wood glue then sprayed with various colours to suit the different areas. The larger shrubs are made of rubberised horsehair, sold for upholstery work, teased out, cut to shape, painted and covered with flock powders including the ground-up sponge and cork types. 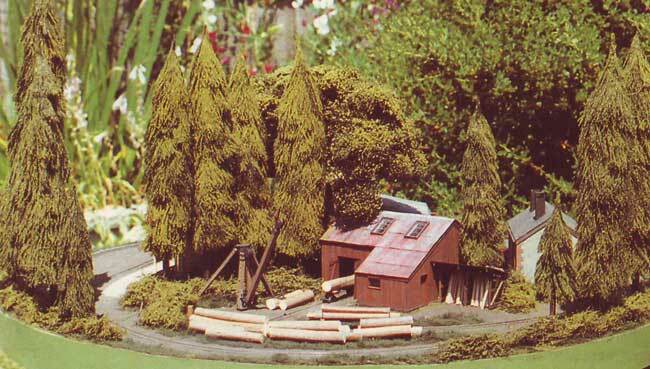 There are two types of trees on the layout, namely the fir trees and the large central deciduous one disguising the baseboard pivot. Firs have various advantages in that they are relatively simple to make, they are tall and thin and they can have foliage down to the ground. Their construction deserves a separate and full description as they could be useful to anyone contemplating a forest. The deciduous tree is made from lots of wire offcuts soldered together with a tube in the middle. The wire was then fanned out, branch like, to form an umbrella. To make it more rigid, the ends were overlapped and soldered together. This was then sprayed matt black and covered with horsehair and flock, as the shrubs. The tube in the middle locates over the end of the protruding pivot rod on the electrical pivot frame (see Baseboard section) and onto the cover box. The footpaths are generally plaster of paris with a fine sand top-coat to give a gravelly finish. 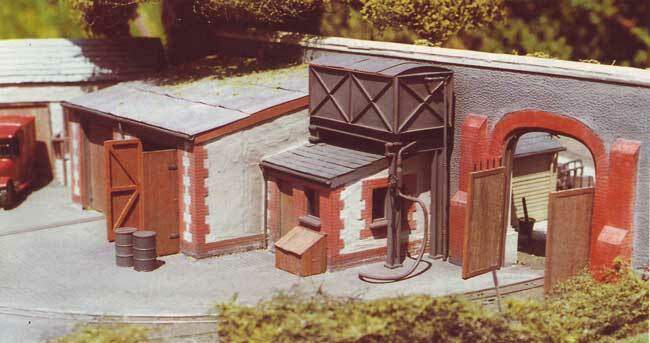 The engine works forecourt is of granite setts as made for 4mm scale by Wills, which I think are just as good for 7mm. The joints between the sheets of setts are filled with polyfiller and scribed to match. The water tower is entirely scratchbuilt of plasticard with some brass tubing and wire pipework. The crane is again scratchbuilt of balsa wood and plasticard and inspired by one at Amberley Chalk Pits. In order to cope with running several trains (!) I decided to break the layout into sections. Each scene has a `feed' as well as the engine shed, which means five wires including the common return. These run via the central pivot to a small free standing control box. At present, I have a feedback controller which, I am told, could account for why my `N' gauge engines run a little hot. The pride of the line is a Springside kit which uses the Ibertren `cuckoo' chassis. I have a non-working Simplex-type unit which is propelled by a motorised van (!) and I am developing another small I/C unit based on a Minitrix long wheelbase 0-4-0 chassis. Rolling stock consists of wagons and timber bolsters built on PECO `N' gauge underframes with excess/underscale detail removed and 009 couplings added, and some 009 wagons with rebuilt tops. As with most freelance narrow gauge lines, there is plenty of scope for all types of stock as well as following the various prototypes such as the Eaton Hall and Duffield Bank railways. The whole layout, from the decision to enter the competition to exhibition took six months of fairly intensive work although this also included the development of the baseboard. As mentioned, the model as a whole was ineligible for the competition that inspired it, but received an award from the committee for the effort, which was gratefully received. 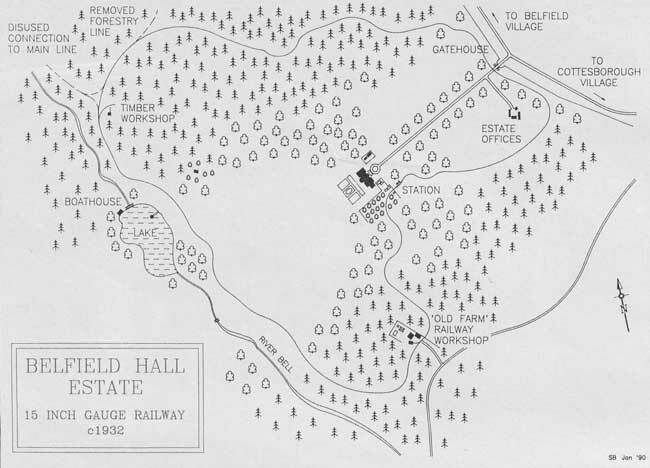 The Belfield Hall Estate was originally connected to the local station a few miles away. The line ran for most of its length along the River Bell and crossing the main vista from the house at a discreet distance eventually terminated at the house station near to the kitchen garden. A spur off the main line ran to the Estate's timber workshop which prepared timber from the estate's own woodland for use on the estate and for local resale. To service the estate's vehicles and railway stock, a railway workshop was built on the site of some old farm buildings, a few of which still remain. As road traffic increased, the railway connection became obsolete and was later removed. In order to make more use of the remaining railway, the lifted track was then re-laid, extending the original terminus, via the main gate, into the woods and through to connect up with the woodland spur off the old line. The railway still serves the Estate in transportation of some commodities, but has long since become a thing of pleasure for the present owners. The creation of this `excuse' has inspired the production of some supportive maps, all of which helped to establish a viable history (in my mind, at least) and while away a few hours in a most enjoyable fashion. The show gets on the road! The first show that the BHER attended was for the Twickenham & District MRC, in 1993. For the show, the rotating base was mounted on a frame with a fabric pelmet. The layout was motorised and, at the press of the large red button at the front, it rotated to the next scene. Kids loved this interaction, although parents were often wary until the kids pointed out the 'Please Press' sign. An over-ride switch at the back allowed the rotating board to remain on. The loco was regulated in one direction by a controller and the contrarotating board by another. This repeated the feature first noticed on the embryonic layout, namely that the train stayed in front of the viewers and the world went by! When challenged, children came up with the most amazing explanations for this effect, which added to the enjoyment.